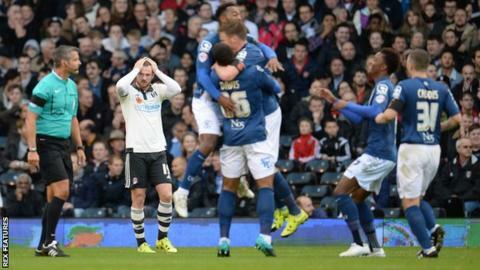 Birmingham City ended a three-game goal drought with a comfortable win over Fulham which was sewn up by half-time. Stephen Gleeson opened the scoring with a low 25-yard shot minutes before Paul Caddis's penalty three minutes later. Jon Toral's shot made it 3-0 by the break, but Fulham's James Husband was then sent off for a second booking. Alexander Kacaniklic gave Fulham hope but Clayton Donaldson and Viv Solomon-Otabor scored late goals for Blues either side of one for Ross McCormack. The home side came into the game with two wins in their last three matches but were left standing by Birmingham's quicker start. Both sides had chances to score before Jacques Maghoma set up Gleeson to net his third goal of the season from 25 yards. Then, on 21 minutes, Caddis scored from the spot after the arm of keeper Joe Lewis brought down Donaldson. Tim Ream went close for Fulham but that just spurred Birmingham to turn the screw and add a third. Maghoma stretched to win a ball that looked to be going over the line and crossed for Toral to shoot high into the roof of the net. Jamie O'Hara's free-kick against the bar was an encouraging sign for Fulham, but after Husband picked up two yellow cards in as many minutes just after the restart, Birmingham began coasting, only for Kacaniklic to capitalise on sloppy defending. In a lively finish, Blues' top scorer Donaldson's fifth goal of the season looked to have made sure of victory. McCormack pulled another back for Fulham courtesy of a lucky deflection, but there was still time for Blues' late substitute Solomon-Otabor to get on the scoresheet - his first goal in league football. "It's very disappointing, I fancied us going into the game, being on decent form with two big wins, so I expected better today. "The third goal wasn't much better, and the sending off completely compounds it in the second half. At 10 men I thought we were quite brave and had a go. "It was a fair red card, to be on a booking it was rash to go in like that, so I have no problems." "I did ask them for a little bit more attacking quality today, and I felt we have been a bit wasteful in the final third, and not being ruthless enough. "I didn't quite expect such a good performance today. We got into some brilliant positions, in the way we broke and kept our shape. "Jon Toral was the best player on the pitch, in terms of his composure and his vision. We know what he's got - he's only 20 years old and starting games for the first time." Match ends, Fulham 2, Birmingham City 5. Second Half ends, Fulham 2, Birmingham City 5. Goal! Fulham 2, Birmingham City 5. Viv Solomon-Otabor (Birmingham City) right footed shot from the left side of the box to the bottom left corner. Assisted by Stephen Gleeson. Attempt missed. Stephen Gleeson (Birmingham City) right footed shot from outside the box misses to the left. Assisted by Maikel Kieftenbeld. Goal! Fulham 2, Birmingham City 4. Ross McCormack (Fulham) right footed shot from outside the box to the bottom right corner. Assisted by Matt Smith. Corner, Birmingham City. Conceded by Luke Garbutt. Dan Burn (Fulham) wins a free kick in the defensive half. Attempt saved. Demarai Gray (Birmingham City) right footed shot from outside the box is saved in the centre of the goal. Assisted by Maikel Kieftenbeld. Corner, Birmingham City. Conceded by Alexander Kacaniklic. Goal! Fulham 1, Birmingham City 4. Clayton Donaldson (Birmingham City) left footed shot from the centre of the box to the top left corner. Attempt saved. Maikel Kieftenbeld (Birmingham City) left footed shot from the left side of the box is saved in the centre of the goal. Assisted by Jonathan Grounds. Substitution, Birmingham City. Viv Solomon-Otabor replaces Jon-Miquel Toral because of an injury. Corner, Birmingham City. Conceded by Dan Burn. Corner, Fulham. Conceded by Jonathan Grounds. Substitution, Fulham. Luke Garbutt replaces Ryan Tunnicliffe. Attempt missed. Ross McCormack (Fulham) right footed shot from outside the box misses to the left. Assisted by Alexander Kacaniklic. Attempt missed. Tom Cairney (Fulham) left footed shot from outside the box misses to the right. Assisted by Matt Smith. Attempt missed. Demarai Gray (Birmingham City) right footed shot from the right side of the box is close, but misses to the left. Assisted by Jon-Miquel Toral. Attempt missed. Jon-Miquel Toral (Birmingham City) left footed shot from outside the box misses to the left. Assisted by Paul Caddis. Jon-Miquel Toral (Birmingham City) wins a free kick in the attacking half. Ross McCormack (Fulham) is shown the yellow card. Goal! Fulham 1, Birmingham City 3. Alexander Kacaniklic (Fulham) right footed shot from the right side of the box to the bottom left corner. Assisted by Matt Smith with a headed pass. Matt Smith (Fulham) hits the right post with a left footed shot from the centre of the box.